Get the right care, right away. If your condition does not require immediate attention, call us or complete the form to schedule an appointment. If you suffer an accident, sports injury, or other acute pain, it’s important to see a specialist as soon as possible. When you visit a traditional hospital emergency room for these types of injuries, you will most likely be referred to follow up with an orthopaedic surgeon. 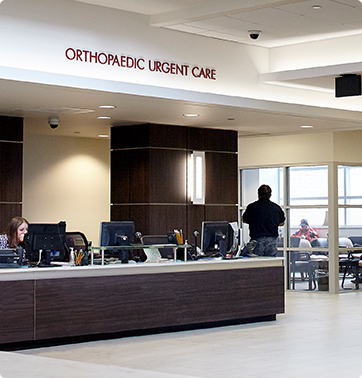 At our orthopaedic urgent care, you will be seen by an orthopaedic surgeon upon arrival. At Spectrum Orthopaedics, we attract the best and most experienced physicians trained in treatment and surgery of hand and upper extremity, foot and ankle, spine and neck, joint replacement, as well as arthroscopic surgery, reconstructive surgery, and sports medicine. Most importantly, our doctors take a personal approach to care, taking the time to build a personalized treatment plan unique to you.